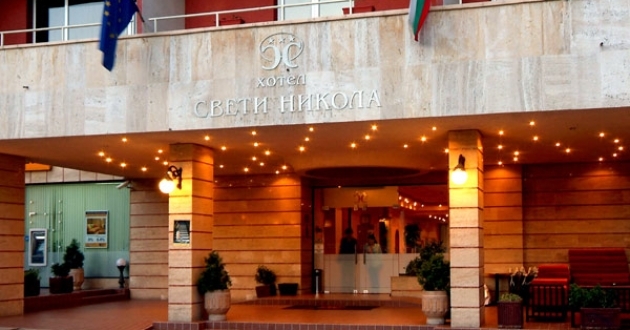 Location: at the foot of Pirin Mountain, in the very center of the town of Sandanski is situated SPA Hotel "Sveti Nikola" - completely renovated, offering maximum convenience and comfort of its guests. Accommodation: the refined and elegant style are part of the interior of 63 double, 21 single rooms and 7 suites, one of them with Jacuzzi. All rooms and suites are stylishly furnished and equipped with cable TV, telephone with direct access, refrigerator with mini bar, wireless internet, central heating, air conditioning, bathroom with shower. In the hotel: indoor swimming pool with warm mineral water and Jacuzzi, fitness, Rome bath, classic restaurant, snack bar with a wine lounge and terrace, tavern Dionyssos-attraction-themed restaurant in the whole Greek-style piano bar, casino, children's playground, CASINO, conference room - small with a capacity of 30 seats and more - up to 100 seats, WiFi-Internet, parking. Тhe SPA Center uses a mineral water - 75˚С, by spring № 6 HG and natural resource KEU № 8, 75˚С. It is recommended for the treatment of diseases of the muscular system, respiratory system, chronic rhinitis, sinusitis, neurological disorders, skin allergies, some kidney and urological diseases. You will be surprised with the special, modern treatments and therapies with high quality products - water procedures and medical, slimming and tone massages. Classical massage, Partial massage, Anti - cellulite massage, Relaxing massage, Aroma massage, Relaxing massage with chocolate cream, Partial massage /back/ with honey, Partial massage /foot/ with honey, Relaxing massage with wine cream, Electro massage. Therapy "Chocolate pleasure", Wine therapy, Wine therapy with bath and hoops serum, Relaxing therapy /back/ with mud mask, Therapy "Mask with sea minerals", Therapy "Figure slimming, flex and relax", Slimming body wraps with algae "Thalasso Special", Therapy "Thalasso Oligo", Slimming body therapy for people with extra weight. Therapy for dry and dehydrated skin, Therapy for oil skin, Relaxing therapy, Face therapy "Chocolate dream"